My name is Natacha and I am a 18 years old amateur photographer living in a farm in the Southern France. I love to combine my two main passions - animals and photography - in one. 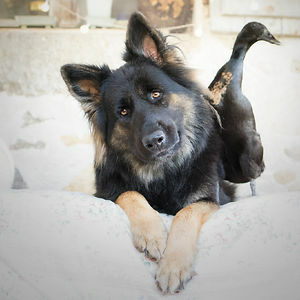 My newest photography series is about the friendship between my dog and my duck. Vendetta, the dog, is an old German Shepherd female. And Lemony is an Indian Runner Duck. 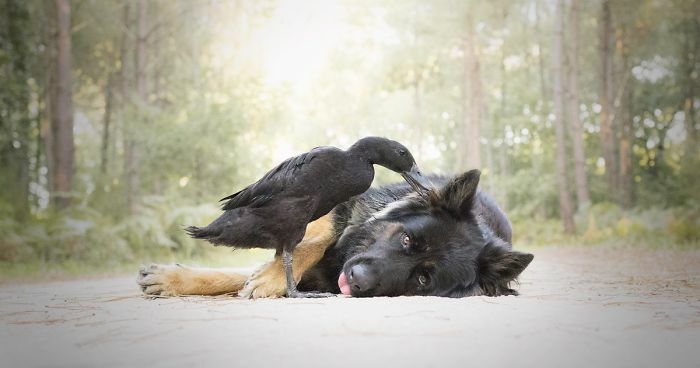 Vendetta is such a sweet and friendly dog with everyone and every animal that when Lemony arrived in our home as a duckling in June 2018, I hadn't any apprehension of putting them together. To my surprise, Lemony was absolutely not afraid and started to follow Vendetta everywhere. Vendetta is completely in love with water so naturally I began to take Lemony together with us to the lake, and then even to the woods and the city. It's really important for me to show this special bond because I truly hope that this will help people to see ducks in a different way - not only as "foie gras" or something, but as the sensitive animals they are. Still, I've got a lot of projects and shooting ideas with them but here are some shots that I wish you to show. I hope you will enjoy them! Hey, there's food in your teefs! Thank you for sharing these photos... They have made my day so wonderful. This is so beautiful. They are such wonderful souls. You are very lucky. I love it. lovely. Can I share? How right you are !!! the doggy is adorable. is he a german shepard? and the duck is too.